So, I’m going to make a major confession here. I AM A COMPLETE TOOL WHEN IT COMES TO SEWING PATTERNS. That’s right. I’m freely admitting to this. As we were driving to lunch I informed my husband I wanted to make this bag, and he said “Why?” to which I replied, “Other people on the internet are doing it.” which is probably the most honest answer I’ve ever given him… and I’m pretty sure he was pretty surprised I gave him that honest of an answer! Anyway, after seeing my good friend Christine‘s Weekender Travel Bag by Amy Butler in progress on Flickr, I was hooked. Even though I realize it’s not an easy pattern to tackle, she made it look fun to make with the multitude of pictures she provided, even though I realized she had to fight with it.. basically blood sweat and tears were poured into it! So here’s the first of many pics..
And because I like to make things complicated, I’m changing the bag up a bit. As you can see, the exterior is supposed to be all one fabric. I do not plan on doing this. 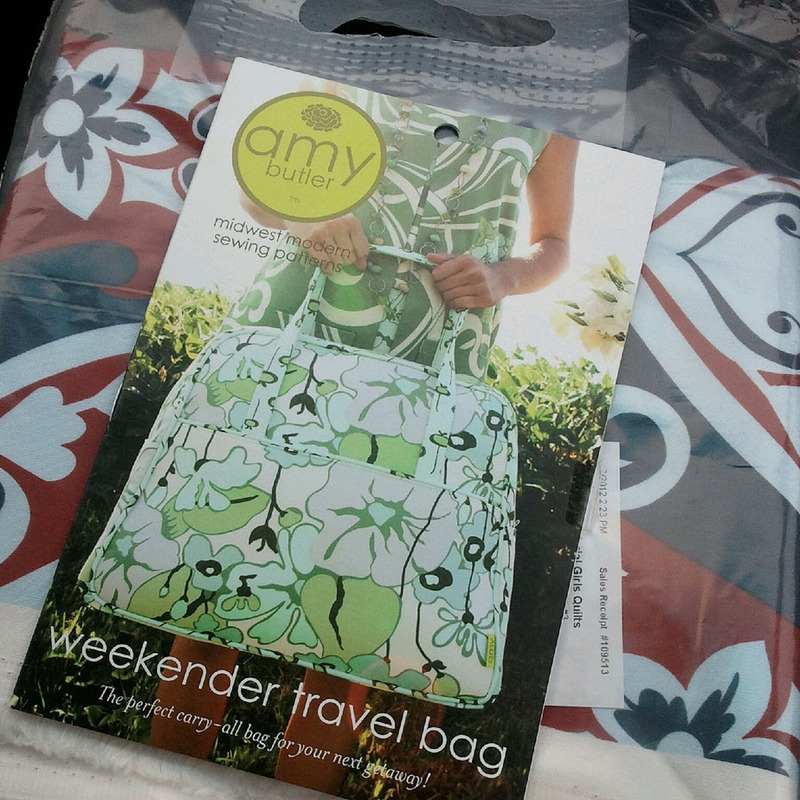 Instead the main large pockets are going to be the Anna Maria Horner fabric that’s pictured in the bag (Queen of Hearts in Steel if anyone was wondering) That I picked up on clearance from one of my local fabric stores, The Material Girls Quilts (yay for Memorial Day weekend Sales!) where I also picked up the pattern. The rest of the exterior is going to be made out of Essex Linen by Robert Kaufman in natural. I’ve got 1.5 yards of that, and since the pattern calls for 1 5/8 yards, I’m set there. I think instead of using either of the fabrics for the bottom, I’ve got a small piece of black Essex I can use for the bottom to show less dirt. Or, I may even buy some pleather/vinyl for the bottom, I’m not sure yet. The Materials list calls for 2.5 yards of fabric for the interior, the handles and the piping. I’m not doing this. Instead, I’m going to use one fabric for the interior -not picked yet-, and then the piping and the the handles in different fabrics. I may chose the same fabric for those, I may chose different fabrics. I haven’t gotten that far yet in planning. I need to check my stash to see if I’ve got enough yardage to do the interior one color, otherwise, I may have to go to Hobby Lobby or another LQS and purchase some.. I will most likely end up using Kona Cotton in a coordinating color. I almost bought some solids at Material Girls, but I didn’t know how much I would need so I ended up just buying the pattern and the AMH. The instructions call to cut two strips of heavy duty Peltex for the straps. Instead of doing that, I’ve got cotton webbing that I will be wrapping fabric around and then sewing the fabric to that. I absolutely detest cutting super long pieces of stuff -it’s asking for 48″ inch long strips- so I figured I can save myself the hassle by cutting just the fabric to wrap around the webbing and call it good.. less long cuts for me. Some folks were mentioning they were cutting the straps at 52″ but due to my tiny size, I think I can get away with the 48″ long handles, and be able to comfortably put it over my shoulder. I’m going to eliminate the exterior side pockets, and the interior large pockets. I think the two pockets on the outside and two pockets on the inside will be enough. This will also cut down on some of the bulk of the seams. In addition, I am probably going to add magnetic snaps on the two exterior pockets for extra security. The interior pockets will most likely be worked to be elasticized.. so I can stuff larger things inside of them. The method for doing that will be pretty simple; just a matter of adding a few extra inches to the pocket pattern. Anyways, that’s as far as I can think of in terms of things to change on the bag. I will of course, mention more as they come up, not really as a how to, since the pattern is pretty coherent, but I’m quite nervous about the whole thing.. I’ve read sewing up the layers is quite a workout for both the sewist and the machine. Luckily, Olga was made to sew through leather to make shoes, so I’m keeping my fingers crossed that she’ll be able to go through the fabric for this. Anyway, wish me luck!